The Electric Leprechaun, middle, Rainbow Eric and Apocalypse Julie “in repose” on their Rainbow Gathering road trip. As I got out of the car at the oasis near O’Hare Airport, I looked over the driver’s shoulder and saw a little man with a red beard, red hair and a small hat jump high up to the top of a industrial sized dumpster to look inside. The Electric Leprechaun was in Chicago – dumpster diving. My 4,000 mile hitchhike from Chicago to Alaska began in that bizarre flash. Bidding a quick goodbye and thanks, I grabbed my backpack and went straight to the little fella, who I found out later was born in Ireland. “You want a ride, we’re going to Montana,” he blurted out, recognizing our eyes had met. The Electric Leprechaun led me to Apocalypse Julie and Rainbow Eric, three 30-somethings from a commune near Burlington, Vermont, on their way to the Rainbow Gathering, in the Rocky Mountains of Montana. We rambled toward the Mississippi River in a faded red 1998 Subaru Outback with 130,000 miles on it, jammed with tents and gear; a Hawaiian hula bobble girl in a green grass skirt on the dash; and a GPS with a sassy female Aussie accent. Inside the car, Electric Leprechaun piped up about his Des Plaines Oasis dumpster booty. About a dozen people share their lives with Fan Belt Cat, “42 bicycles,” and dumpster meals. I wondered how much this ride might resemble the magic bus in “The Electric Kool-Aid Acid Test.” Carina-Carina – their car’s name – was no magic bus but they shared ‘merry pranksters’ DNA, calling themselves ‘hippies’ and living solidly inside a counter culture still alive in America. Except, while Tom Wolfe wrote about a new wave, my pranksters were more like rogue waves – a collection of waves from different directions and storms. They lived in the moment, looking out Carina-Carina’s window for the unexpected, and were bound for hippie glory town, Rocky Mountain Oz, the Rainbow Gathering. They had a sassy GPS but were lost except in their common goal of seeking a different way to live. Post-60s hippies, they deal with the failure of earlier LSD-fueled dreams and the lingering love for a similar vision. They personified what I thought of as the Rainbow Gathering, a group of people gathering in a National Forest to express their vision of the world and their sense of community. It’s roots in the 1960s, Rainbow Gatherings attract tens of thousands of people from around the world focused on peace, love and harmony. All of them aligned against mainstream capitalism, consumerism, dirty energy, mass media and popular culture. I too want peace, love and harmony and I’m against the way things are now. 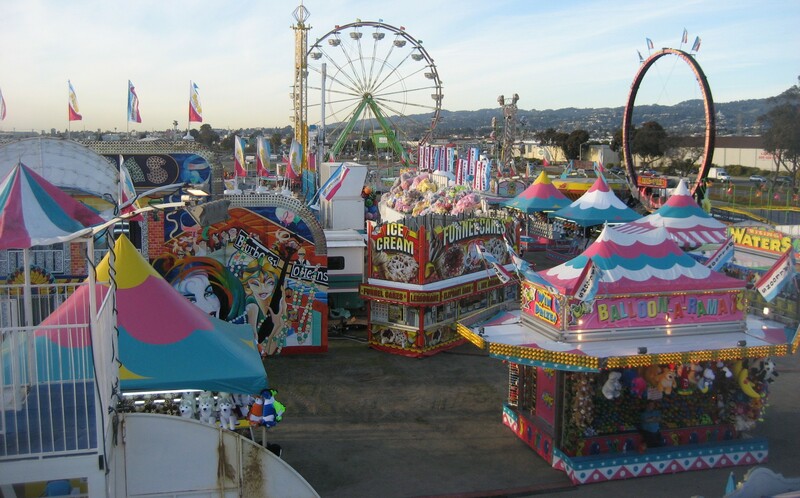 My vision is more limited, I want to get to Alaska to join a traveling carnival and tell their stories. Which makes me less utopian, less ambitious and less far out. Still, hitchhiking to Alaska carries a 60s vibe and I am a surprise on their cross-country road trip. I’m no prankster but I’m a real trip. She has a fresh complexion, bright eyes and strawberry blond hair. She wears a chopstick with ornaments in her hair, a flowered sun dress and pink, orange and green sunglasses. She says she got the nickname from volunteering for two years in post-Katrina New Orleans, much of the time as a FEMA mechanic. Claiming she’s a veteran of 50 Rainbow Festivals, she says she spent about a decade of her 31 years on the road following Rainbows. She’s interested in my EyesLikeCarnivals project because she once sold funnel cakes for an Eire, Pa. carnival until she could raise the bread to split town. Everyone in the car is multidimensional but she’s got the a stack of professionally designed business cards. Separate business cards say she is a pet taxidermist; hairdresser; underwater investigator; licensed private investigator; licensed motorcycle courier; gymnastics coach; home douche provider; mechanic; zipper fixer and more. “I probably have a short attention span,” she says of her wide interests. She runs the commune’s bicycle “chop shop,” as the Electric Leprechaun calls it. People in the house gather abandoned or old bicycles and fix to sell. In a house with just a trickle of a cash income, it pays some bills. She eventually went back to University of Vermont and got her degree in international development but she eschews the Peace Corps., hearing stories about “people who waste a couple of the best years of their lives in a hut” somewhere, nowhere. Also, she hears you might have to get up early and she hates getting up early. Despite her many skills, her aversion to early rising limits her options. Apocalypse shakes her head ‘yes,’ wincing at the bane of her existence – the common potato. Part II will feature the Electric Leprechaun, a Rainbow Eric video, and the end of the Rainbow road.